Highland NY is a hamlet in the Town of Lloyd that sits on the west bank of the Hudson River. This small Ulster County community provides easy commuter access via its location along Route 9W. Routes 44 and 55 also run east-west through the town. Highland is the closest community to the western side of the Mid-Hudson Bridge, making for a convenient commute across the river to Poughkeepsie. 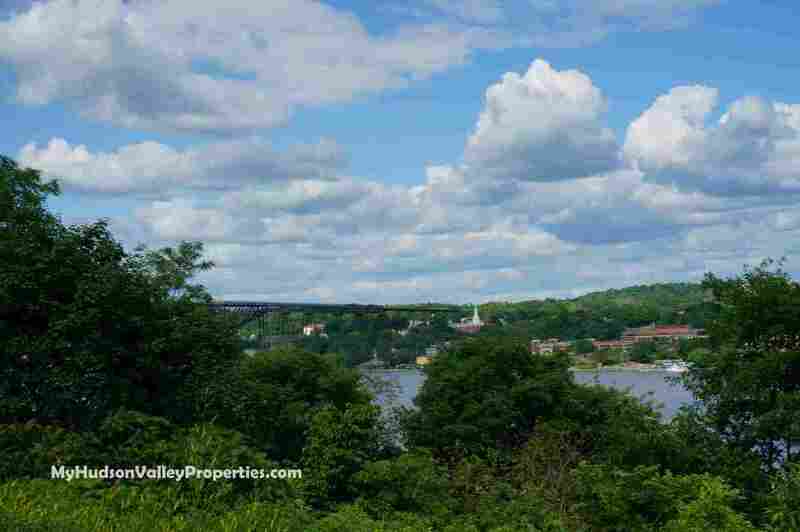 Did you know that homes in Highland NY can have Hudson River views? According to the United States Census Bureau, Highland’s 5.1 square mile area is home to over 5,600 residents. Homes in the hamlet are of varied styles, sizes and age. New construction homes are popular and many seek out builders that will build a custom home in this area. Finding land to build on is not that hard. Like much of the Hudson Valley region, Highland is known for its rich history and natural beauty. Despite its small size, it is home to two New York State Parks. Residents and outdoor enthusiast come from around the state to hike, bike, skate, showshoe, ski, and even ride on horseback along the Hudson Valley Rail Trail, which connects with the breathtaking views of the Walkway Over the Hudson. The Franny Reese State Park offers other opportunities for biking and dog-friendly (but challenging!) hikes, but even I can do it, hence the difficulty is not all that stressful. Students that live in the Hamlet of Highland attend the Highland School District. Details and local information on this school district and others is helpful when making a decision where to live. Higher education options are plentiful due to the central location. We are close to SUNY New Paltz, Vassar and Dutchess Community College. All three are within a 20 minute commute. Could a home in Highland NY be right for you? A variety of styles, sizes and prices are available. Some homes available are waterfront properties. Have you been lucky enough to see the Hudson River? We also have a unique new community of affordable homes to be built that will be on the market shortly. Be sure to let me know if you are interested in a new home as not all new construction find its way in the MLS. Let me show you around. My knowledge of the local area where these homes will be, will help you find the perfect fit. Our commuter friendly location around the Hudson Valley is what usually what wins over our new transplants. Take a peek below to see some examples of the wonderful houses currently on the market, and feel free to contact me for more information on how to find the perfect Highland NY home for you and your family.